Moldex® 2740 R95 Particulate Respirator With HandyStrap® & Ventex® Valve – Medium/Large R95 Oil & Non-Oil Protection NIOSH certified under 42CFR84 regulations to have a filter efficiency level of 95% or greater against oil and non-oil based particulate aerosols up to 10x PEL. Hangs Loose HandyStrap® allows mask to conveniently hang down around the user's neck so its always ready for use. And during wear the adjustable cloth strap is more comfortable and cooler. Vent Hot Air, Stay Cooler Exclusive Ventex® valve lets the hot air out faster so breathing resistance is reduced and workers stay cooler. Dura-Mesh® Shell Lasts Longer Exclusive Dura-Mesh® shell protects the filter media so it stays cleaner looking longer. Plus it resists collapsing, even in heat and humidity so the respirator holds its shape longer. The result is fewer respirators used and lower costs. Applications Hot, humid and dusty environments such as welding, soldering and brazing, grinding, sanding, sweeping, bagging, stone quarrying, metal machining, cement, underground mining, polishing, buffing, lime, poultry and textiles. For oil and non-oil based particulates. Features • 100% PVC-Free. • HandyStrap®, with buckle, allows mask to hang around the user's neck when not in use. 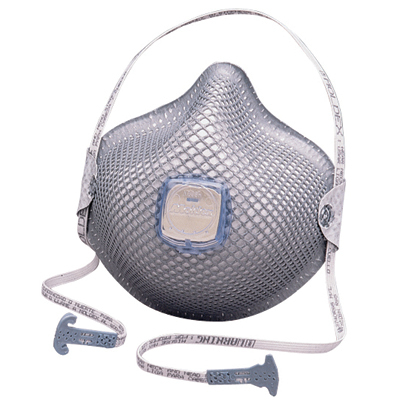 • Ventex® valve lets the hot air out faster so workers breathe easier and stay cooler. • R95 protection against both oil and non-oil based particulate aerosols. 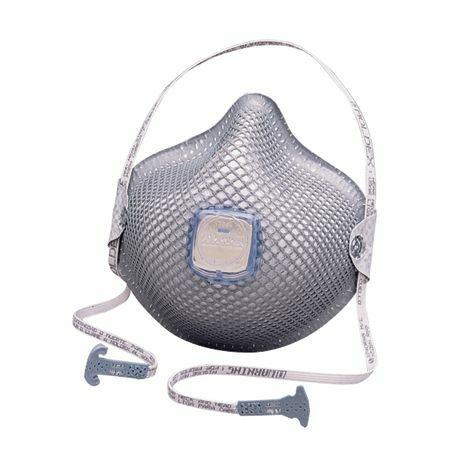 • Soft foam nose cushion for added comfort and no pressure points. • Exclusive Dura-Mesh® shell resists collapsing in heat and humidity. • Meets heat and flame resistance in accordance with ANSI/ISEA 110-2003 Section 7.11.1.